Pouring into our Golden Retriever puppies a healthy, positive start in life is what matters most to us. And we do this by building a relationship. We believe this is foundational to all other learning that will take place within a pup's first 8 weeks, as well as for the entire life of the Golden. Our imprinting practices are based upon years of experience, as well as performance in the field of service, therapy, emotional support, and companionship. Each season, we strive to learn and impart more into our program and into our Goldens. It is a life-journey, both canine and human. Our Specialized Imprinting and Puppy Enrichment Program is something we feel sets us apart and differentiates us from other breeders. Puppies are impressionable for the first 16 weeks of life. At the very minimum, your breeder will be the responsible for half of this imprinting period. 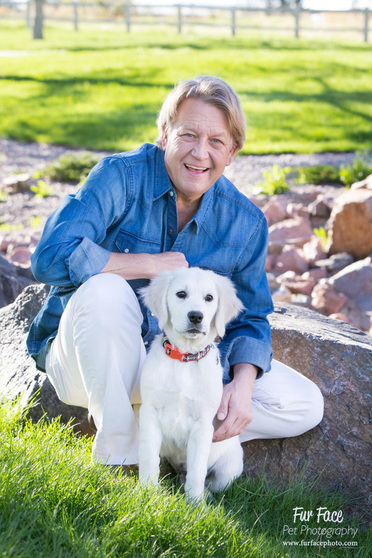 Getting to know your Golden Retriever breeder and their care practices is essential in choosing the best puppy and breeder for you...because even the best lines and pedigrees in the world need a positive and intentional imprint to live up to their potential. We can't overstate enough how this process builds trust between the puppy, the handler, and his or her environment. And trust builds confidence and relationships, encouraging healthy development. This intentional and focused approach to imprinting is what sets us apart and allows us to provide your puppy with a positive imprint that will not only benefit you, but your Golden for a lifetime. Check out why our imprinting and enrichment practices are essential for growing puppies by clicking below. Prince (Silas/Ina) - Service Dog with Veterans Moving Forward, Inc. Prince, an Ina/Silas son, is a special boy for us [Snitker Goldens]. Not only was Prince a part of bringing Veterans Moving Forward (VMF) into our lives and our program, but he has been a part of shaping and restoring Maureen's life - she and Prince recently performed at the White House! We hope you enjoy this look into Maureen and Prince's life in "A Service Dog and His Veteran" (published in September 2016). Copyright © Jasmine Cen & Yunfei Zhao in association with Veterans Moving Forward. ​This video has been used with permission and may not be copied or used in any way. We believe in our imprinting practices - and so does Nan Long, an AKC Canine Good Citizen evaluator, Association of Professional Dog Trainers member, and owner of DogWoods Retreat. Thank you for the opportunity to work with you and your amazing Golden Retriever puppy, Dickens. Besides being gorgeous, he has the intelligence and temperament to match. It made my heart sing when you told me that you had picked a breeder who health tests, temperament tests and also imprints their puppies! The fact that you chose a premier ethical breeder, Snitker Goldens, and that they matched you with your puppy (Dickens) is another component in your success. You are a wonderful team, and your work together has set you on the path to, a not-so-distant future, AKC Canine Good Citizen award. Thank you again for allowing me to be part of your journey. "As I spent more time looking into Snitker Goldens and their Imprinting Program, I became more intrigued and interested in what their program was all about. I made the decision, filled out all the paperwork, sent in my deposit and learned that I was accepted. What I had overlooked was their evaluation process and Forever Home matching process, at first this was somewhat concerning to me since in the past I was able to pick out what I felt was the best puppy. After discussing this...it made complete sense to me why they do what they do. I’ve had Humphrey Bogart, aka, Bogey now for 6+ weeks and he is the absolute perfect puppy for me and my lifestyle. Had I picked, I would have looked for a high energy active puppy, that would have been an absolute mistake. In the past, I had large land areas with lots of water available, and a high energy dog was perfect. That's not the case for me at this time, but I would have tried what worked in the past and that would not have been fair to my puppy or me. What I'm fortunate to have in my life now, thanks to the process Snitker Goldens use is a calm, more relaxed puppy that still loves the outdoors, but is super well mannered with almost no additional training as of yet that can come with me to the office (he comes with me to the office on average 3 days a week). The breed, the breeder and process they follow is outstanding and I hope to adopt another puppy from Snitker Goldens next year so Bogey has a brother to play with." Snitker Goldens breed pairings are made for three main reasons: pedigree/conformation, health, and temperament. ​Each of our little Snitker Golden puppies receives excellent, hands-on care from Day One with our Specialized Imprinting and Puppy Enrichment Program. We focus on intentional routines and exercises, work to reach developmental benchmarks, use intensive socialization techniques, and begin basic training skills. Information on our current puppies and/or upcoming litt​​ers is updated daily. Take Me On A Tour!